Everyone is talking about an ancient grain called Emmer Wheat....one of nature's forgotten foods that has been rediscovered in the last few years. Our mission in supplying Emmer Wheat is to cater for people who can eat small amounts of gluten and be able to use an ethical, healthy, organic heirloom (not mixed with other varieties) wheat in their cooking. Our Australian supplier bio-dynamically grows the wheat without artificial chemicals and using a holistic system, including the use of manure and compost. 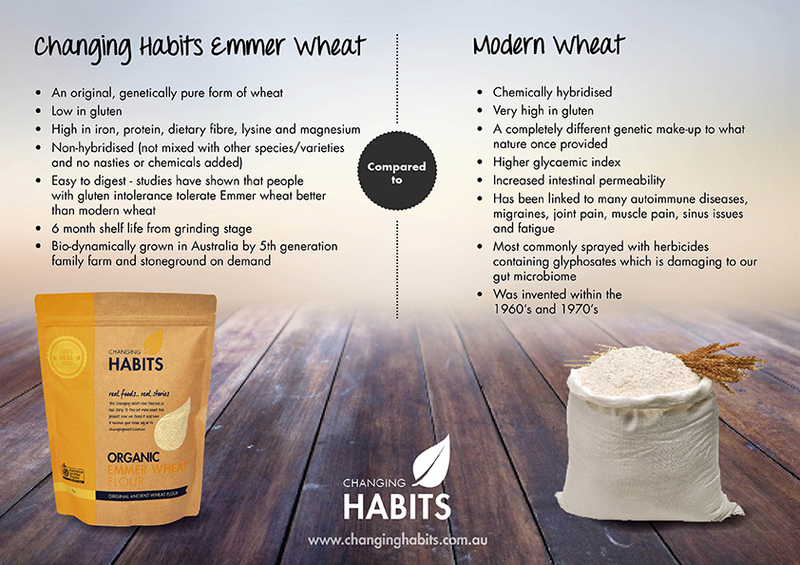 Grown and stoneground in Australia, Emmer Wheat has shorter shipping and turnaround times, as it has a relatively short shelf life, and a more consistent and reliable supply than Einkorn. It can be used in any recipe that requires plain flour and can be substituted for Einkorn in all Changing Habits recipes. Storage instructions: To prolong the freshness of Emmer Wheat, it must be kept in the fridge or freezer. Create a new healthy eating ‘culture’ with you and your family by using this Emmer Wheat flour in your baking and cooking (click here for baking tips and sweet and savoury recipes). This all-purpose, delicious flour can be substituted in any recipe where plain flour is required but does absorb more moisture so you may need to lower the recipe’s flour content slightly to accommodate the difference. With a savoury and nutty taste, this flour is great in traditional and herb breads, pizza bases, rolls, muffins, cakes and slices. We have tried it, tested it, tasted it and strongly believe in this wonderful product and have included plenty of recipes and baking tips under the 'Recipes' tab. Emmer Wheat is a traditional heirloom wheat grain, a variety of wheat that was used during earlier periods of history. It has not been manipulated nor hybridised (a cross pollination of plants) by modern methods. It is a wheat that research tells us has been used for thousands of years, not only by tribes of hunter gatherers but also for many thousands of years by the early agriculturists. Emmer Wheat was used in biblical times. Traditional breads and gruels have been eaten for thousands of years using the old fashioned traditional heirloom wheat grain. However, since the introduction of the new wheat grain (modified by humans), more and more people are finding that wheat is intolerable to them in many different ways, such as gluten intolerance, gut problems and autoimmune diseases. Changing Habits always looks for food that is traditional and can help you in the kitchen by supplying you with the ingredients you need to provide healthy meals for you and your family. Finding organic Emmer Wheat has not been easy….it has taken nearly three years to locate a supplier who produces the wheat without using chemicals and who can supply the quantity and turnaround time needed. This beautiful Emmer Wheat is bio-dynamically grown using a holistic system used in agriculture. In addition to the exclusion of artificial chemicals, biodynamic farming emphasises the use of manure and compost to create a balanced ecosystem. This way of farming produces a rich soil, which in turn produces a nutritious product. Our mission in getting organic Emmer Wheat is to cater for people who can eat gluten and be able to use an ethical, healthy, organic heirloom wheat in their cooking. We want the mothers of the next generation to be able to cook bread, cakes and muffins with a main ingredient that has not been compromised and will not compromise the health of their children. Cyndi was a mother who made everything from scratch. She purchased organic wheat flour and made everything; her family had no packaged breads, cakes or muffins. Back in the late 1980s and early 1990s when she was raising her family, she didn’t know that wheat grain had been tampered with. It wasn’t until Dr William Davies wrote his book, Wheat Belly that she learnt that the growing gluten intolerance was not just about the amount of wheat being eaten, but also what had been done to the wheat plant and thus to the composition of the wheat grain. We are extremely excited there are farmers in Australia producing Emmer Wheat again so the next few generations can have traditional heirloom wheat in their foods. It’s important to take the steps to live a healthy life by eating the best quality food possible.